We have moved to a new location in Merrimac, MA. Our new facility is larger, and we have added staff. We would like to thank our customers for their ongoing business and support. Your success is our goal. 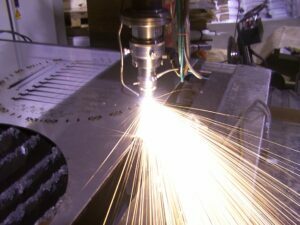 How Laser Cutting Can Apply to Your business. CIean edges on high temperature and corrosion-resisting alloys like Hast-X, Inconel , Monel ,Waspalloy, etc. Unique nesting capabilities reduce material costs – cut smaller parts inside the cutouts of larger parts. Pre-production, prototype and short runs. Any shape. Accuracy, repeatability. No minimum quantities. Thickness capacity to 1/2″ steel and Stainless, Hastelloy, Inconel Monet, Waspalloy, other exotics. Cut thousands of holes in a sheet metal part without the warping and “oil-canning” of mechanical force methods. Eliminate long lead times for special tooling. Develop and test flat patterns for proof of design before building expensive dies. Cut shapes that are difficult with mechanical means – long arcs, free-forms, etc. Choose laser cutting when materials are too thick or too hard to punch. Non-contact machining of plastics and other non-metals. Sign Lettering of all sizes and fonts. Work directly from your .DXF and .IGS files. Rapid turnaround and on-time deliveries. Creative staff, with twenty years of laser cutting experience, providing fast and economical solutions. Quality that is reliable and consistent.